Movie Lovers Reviews: Dr. Seuss' How the Grinch Stole Christmas (1966) - Oh, You're a Mean One to the Opposition! 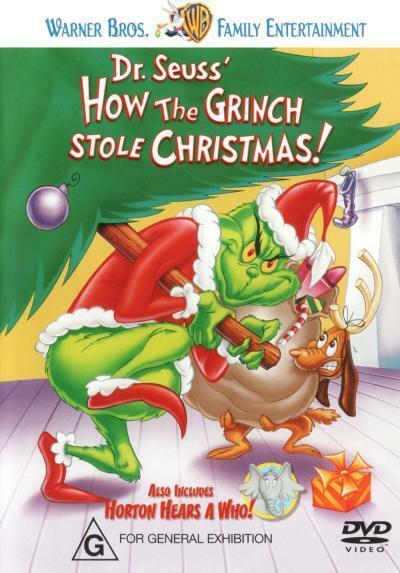 Dr. Seuss' How the Grinch Stole Christmas (1966) - Oh, You're a Mean One to the Opposition! Dr. Seuss' How the Grinch Stole Christmas (1966). The mid-60s was a strange time in the animation world, and it was a long, hard road that culminated in "How the Grinch Stole Christmas" (1966). Walt Disney's animation studio had been stumbling, and Walt Disney himself seemed more interested in his new theme park business and live action movies than he did in creating animation that people wanted to pay to see. Thus, there wasn't a lot of competition in the animated feature film arena, but that didn't mean there weren't good animators in the other studios. Television, which had sporadically featured animation, suddenly proved to be particularly receptive to animation, with Saturday mornings becoming a popular time for children's programs. However, the ultimate goal of top animators was to reach a wider audience of both kids and adults. "How the Grinch Stole Christmas" hit it out of the park in this regard. 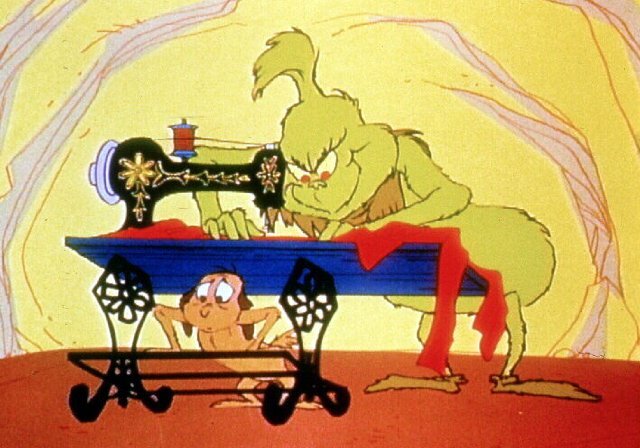 Making the Santa costume in "Dr. Seuss' How the Grinch Stole Christmas." Chuck Jones was king in the animation field in the '60s. He had been in the business since the early 1930s. It hadn't been all wine and roses for Chuck, as had seemed at times to be the case for Disney (at least creatively). Early on, Jones specialized in lavishly animated productions that, well, weren't very funny. Some attributed this to his attempts to copy the Disney style, which was very formal and labor-intensive. Never one to resist a challenge, he created character after character, including many now long-forgotten relics such as Charlie Dog, Hubie and Bertie, and The Three Bears. Eventually, after arduous trial and error, he finally hit the sweet spot and, as he put it, "learned how to be funny." 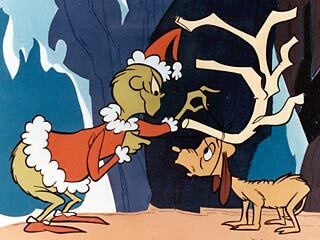 The comic touch of Max's antlers is the icing on the cake in "Dr. Seuss' How the Grinch Stole Christmas." Chuck worked closely with Theodor Geisel, aka Dr. Seuss, on war projects during World War II. It was tedious work for an unappreciative audience, but it helped the war effort and gave him good practice. He still struggled with his own projects, but at least he had time to try some things and see what worked. 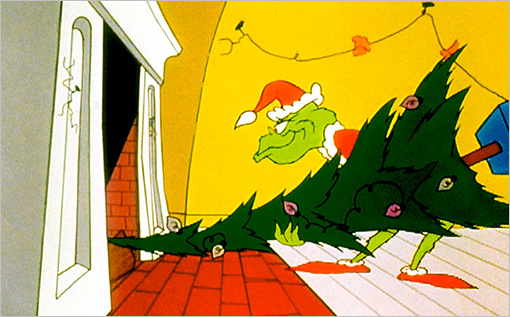 The Grinch is a harsh taskmaster in "Dr. Seuss' How the Grinch Stole Christmas." After the war, things finally started to click. People started to appreciate his characters, and some caught on like wildfire. Marvin the Martian, Pepe LePew, and most successful of all, the Road Runner and Wile E. Coyote were praised as some of the best cartoons ever made. The Grinch does a little dance in "Dr. Seuss' How the Grinch Stole Christmas." Finally, in the early 1960s, Chuck thought he had the chance to really hit the big time and topple Walt from his animation feature-film throne. "Gay Purr-ee," produced by UPA, promised to feature the voices of the top names in Hollywood: Judy Garland, Robert Goulet, and Red Buttons. These were people even Walt couldn't get. So, without telling his bosses at Warner Bros., he worked on the film surreptitiously and released it to UPA. UPA, though, needed a distributor, and it found one - Warner Bros. Finding out that Jones had violated his exclusive contract with them to work on the film, Warner Bros promptly fired him. Making new friends in "Dr. Seuss' How the Grinch Stole Christmas." Shrugging it off, Chuck started his own animation studio, Sib Tower 12 Productions. Getting his old friends at Warner to sign on, Jones managed to have MGM buy him out. While his work still was critically acclaimed, a lot of it was getting stale, such as Tom and Jerry cartoons that would soon be cancelled. 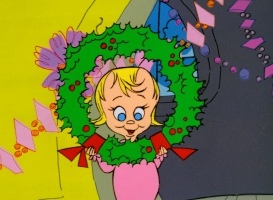 Cindy Lou Who in "Dr. Seuss' How the Grinch Stole Christmas." Remembering his old friend Theodor from World War II, Jones got together with him and discussed an ambitious plan: they would produce specials for television of some of Geisel's kid-friendly works. The first one would be "How the Grinch Stole Christmas," and they would go the route of "Gay Purr-ee" again and get someone really good to do the headline voice of The Grinch. He suggested Boris Karloff, but Geisel was hesitant - he really didn't think Karloff had the voice for it. Jones promised they could fix that in editing, and Geisel reluctantly went along. They got a production company together to do the film, Cat in the Hat Productions, and with backing from MGM were ready to go. 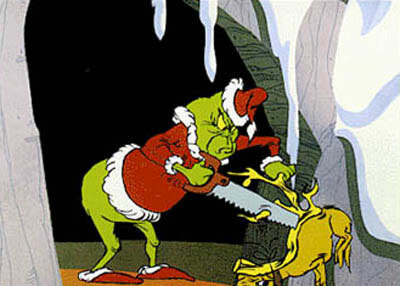 The Grinch is too cheap to get a power saw in "Dr. Seuss' How the Grinch Stole Christmas." The plot of the special was straightforward and faithful to the book. The Grinch (Karloff) lives in a cave atop Mt. Crumpit, far above Whoville. He is the meanest man in the land, and especially hates Christmas. It is Christmas Eve, and he decides to finally do something about Christmas: he will disguise himself as Santa, and steal it. 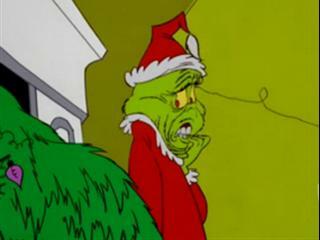 The Grinch is great with all his emotional swings in "Dr. Seuss' How the Grinch Stole Christmas." 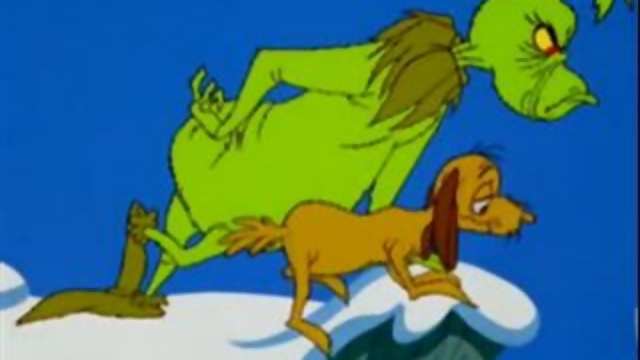 Disguising his dog Max as a reindeer, The Grinch loads empty bags onto a sleigh and gets to Whoville. He has to pretend to be Santa when a little girl, Cindy Lou Who (June Foray) spots him stealing all the Christmas trees. He calms her down and says he is just "fixing" them. She goes back to bed, and he manages to steal all the food and decorations from the entire village. Looking down on Whoville in "Dr. Seuss' How the Grinch Stole Christmas." 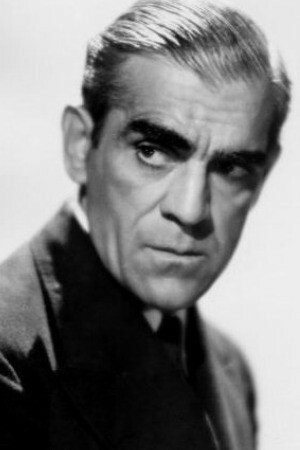 This is THE MAN, Boris Karloff, star of "Dr. Seuss' How the Grinch Stole Christmas." The show wasn't all that successful at first - the schedule was getting loaded with all these Christmas specials, such as 1964's "Rudolf the Red-Nosed Reindeer" - but the networks kept airing it. Within a few years, it had become a classic, and Chuck Jones, if he hadn't found his place in animation immortality before, sure had found it now. A sleigh full of presents in "Dr. Seuss' How the Grinch Stole Christmas." There is so much to love about this feature that it simply defies criticism. 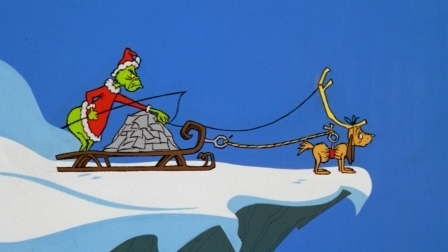 The animation is punchy, and Jones' lessons about "learning to be funny" paid off in spades with his drawing of Max, The Grinch's over-worked sled-puller comically outfitted as a reindeer. 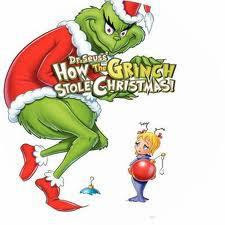 The theme song, "You're a Mean One, Mr. Grinch," performed by Thurl Ravenscroft, quickly became a seasonal classic that gets radio play to this day. Stuffing a tree up the chimney in "Dr. Seuss' How the Grinch Stole Christmas." 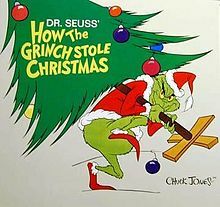 Best of all, the narration by Karloff is perfect, and he has a slightly different voice as The Grinch to differentiate the character. Even the townspeople of Whoville, with their simple response to the theft, works perfectly. Who can't be charmed by the little girl, who innocently confronts The Grinch about his actions and forces him to get his first doubts about his actions? 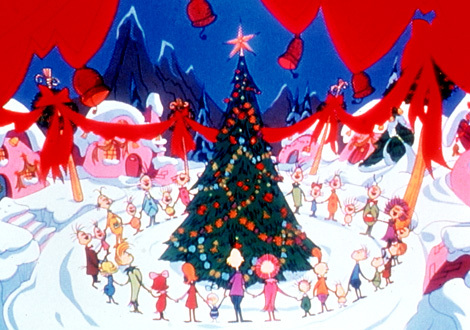 Whoville is joyous, it is Christmas in "Dr. Seuss' How the Grinch Stole Christmas"! The show continues to be broadcast annually on a major network. In 2012, it was used as the lead-in for the finale of "Dancing of the Stars" and got fine ratings. Chuck Jones, who passed away in 2002, finally got his monster hit. Below is the classic song, accompanied by graphics from the show, as sung by Thurl Ravenscroft. Happy holidays! "Dr. Seuss' How the Grinch Stole Christmas" (1966).